Krispy Kreme is offering a Buy One Get One FREE Dozen Original Glazed Kripsy Kreme Donuts! 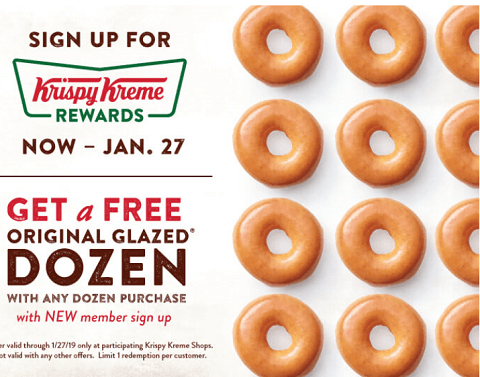 Simply Sign up for Krispy Kreme rewards – with the app or on the website. You will get a reward offer in your account for a FREE dozen original glazed doughnuts when you buy ANY dozen (assorted or glazed). Just give your phone number or scan your reward barcode at checkout Through Janaury 27, 2019.